The Circuit of the Americas always puts on a good show, and whilst the racing was a mixed bag this past weekend, the activities surrounding the on track action were brilliant as always. Drivers really felt the need to go out and try new things, including pre-race rope throwing, as well as visiting the epic Johnson Space Center. Some drivers stuck to their tried and tested material with Romain Grosjean trying to convince everyone he doesn't moan before being resolutely told off for complaining by his team. Interesting times at Haas! As always, let me know if you spot anything I missed - there was a lot to look out for this week! +1 Valtteri Bottas: Valtteri is clearly very confident in the kitchen, declaring his food very tasty. +1 Sergio Pérez: "I can make you a very nice pasta." 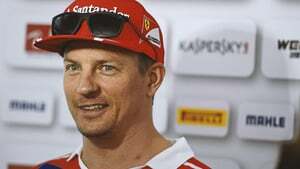 +1 Kimi Räikkönen: Hoping Kimi doesn't really have his wife on the menu. +1 Stoffel Vandoorne: I think Stoff is happy about Fernando staying with the team. I think? +2 Lewis Hamilton: Nice little Mercedes/BOSS video, spending some time on the water, in the rain. +1 Max Verstappen: Quite brave to take on an NFL training session, running into big athletes with pads! +1 Daniel Ricciardo: Quite brave to take on an NFL training session, running into big athletes with pads! +2 Max Verstappen: Having a lot of fun visiting NASA ahead of the US Grand Prix. +2 Daniel Ricciardo: Having a lot of fun visiting NASA ahead of the US Grand Prix. +2 Lewis Hamilton: Having a lot of fun visiting NASA ahead of the US Grand Prix. -1 Romain Grosjean: Finally pushing his team over the edge and being told to shut up moaning mid-race. +1 Romain Grosjean: Embracing the meme about his moaning with a special helmet addition. +1 Fernando Alonso: Putting himself in line for a rope demonstration with Hülkenberg. +1 Nico Hülkenberg: Putting himself in line for a rope demonstration with Alonso. +2 Lewis Hamilton: Spinning around the COTA track with Usain Bolt! +1 Kimi Räikkönen: Love his explanations of the mechanical aspects of the car. "The turbo stuff or something."